Welcome Back! In this article I wanna show you one of the most important guitar scales I have leaners and that you should learn. No, I am not talking about the pentatonic scale, we all love it and come up with great licks with it, but this time it’s a different one. I wanna show you a scale that is made up of only 7 notes. I am talking about the minor scale. The minor scale is a very important scale very guitar player should learn. You should learn how to improvise using it. You should learn all over the fretboard. This position uses mainly open strings so it’s perfect for beginners, and at the same time it is great for advanced players. I’ve seen some of the best blues players use the the A minor scale or the E minor scale in this position with open string. I’ve seen them rock out their guitar, bending their strings in the 2nd fret where it is extremely hard. You should just learn this scale trust me. I know, it looks like a lot of work, and it is! But if you practice them everyday, you will be able to master it. I remember a time when all I knew was the pentatonic scale. But I decided to practice the major scales with all its modes (including the minor scale) everyday; and today I can proudly say that I know all of these scales across the fretboard and I am able to improvise and come up with new ideas on the go. Practice them everyday, 3 times a day and you will learn them. 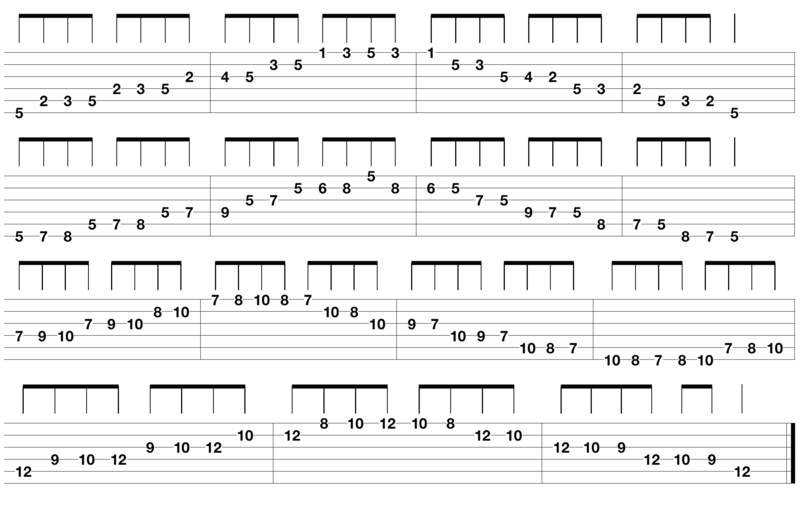 Download some great jam tracks and play these scales. Use scale patterns, skip strings, bend some strings; do whatever it takes to know them like the alphabet.